December 1 is here, which means many houses will start their Elf on the Shelf tradition this week. 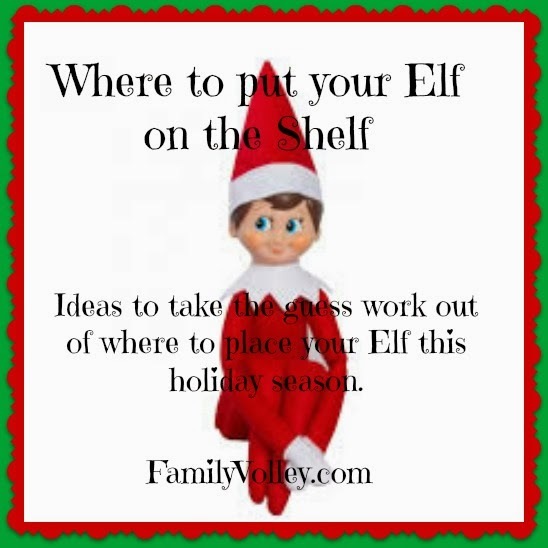 (If you are unfamiliar with Elf on the Shelf, see this post to tell you more about it and give you some fun modifications you can use in your house). One of the biggest complaints from parents is that they want to do Elf on the Shelf, but they run out of places to put him. Which seems pretty normal seeing as how you have to come up with 24-25 ideas. That can be a lot. Especially will all of the other responsibilities that come with the holiday season. Well, look no further. Family Volley is here to help. Every Saturday I will post a weeks worth of locations for your elf. This will take all the guess work out of your tradition. If this has been a tradition that you have wanted to start, now is the perfect time. Even if you don't start December 1. Just start. You kids will love it. 1. Let your Elf arrive in style. Use a Kleenex/ paper towel/ or small scrap of fabric and some string to make a parachute for your little elf. Hang him from a ceiling fan, light, hook, any where. Tuck a little note in his arms announcing his arrival for the season. 2. Place your elf next to the calendar. Give him a pen and have him circle Christmas Day. You can include a little note about how "he will be watching over everyone for the next few weeks." 3. Prop your Elf up and have him reading the toy catalog. 4. Put your Elf in the bathroom, wrapped up in a pile of toilet paper. 5. Set out the cereal bowls and cereal and have your elf eating some breakfast. 6. Set your elf up in the bathroom, getting ready to brush his teeth. 7. Place your elf next to other friends in the house. Have him join other stuffed animals and action figures, "Toy Story" style. They can be having a little tea party, playing a game, or building a tower together. Does your house celebrate with the Elf on the Shelf? Those are some spectacular ideas! 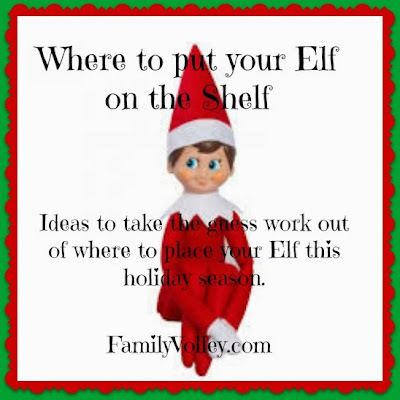 This is our first elf year so I will have to keep them in mind! But the kids are not suppose to touch their elf. Did u read the book?